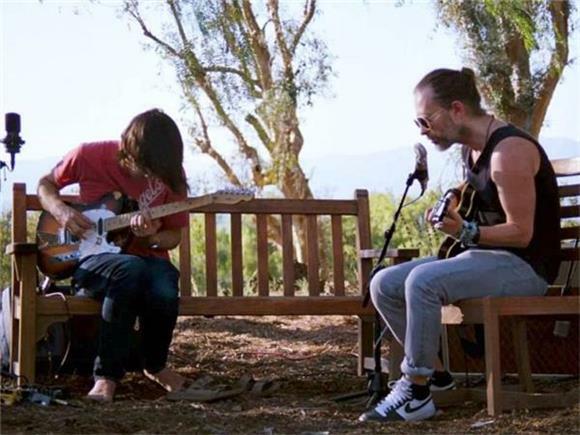 In this simplistic yet breathtaking video directed by Paul Thomas Anderson, Radiohead's Thom Yorke and Johnny Greenwood get intimate with their guitars and a CR78 synthesizer. Set back among a California park, the pair deliver a live and down-to-earth performance - their moods almost matching the laid back flow of the willow trees in the background. The video ends with Greenwood switching off the synthesizer and Yorke mumbling "probably" at the end. Hmm, mysterious. "The Numbers" is from their album A Moon Shaped Pool released earlier this year. Paul Thomas Anderson has collaborated and directed "Present Tense" and "Daydreaming" as well. It's needless to say that these live videos are a hit. Cozy and perfect for fall weather, you'll definitely want to give this video a look.